The Art Rising is a social art project founded by Angeline Chen and Kyle Block committed to creating art that spreads awareness for social and environmental injustices, building a movement of social responsibility. They engage communities and empower individuals around the world, seeking to preserve indigenous art forms in the process. 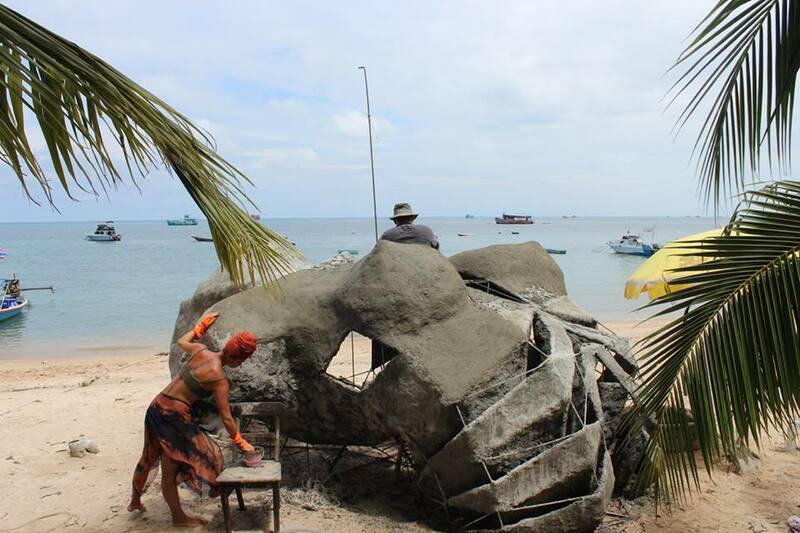 One of their recent projects, Mazu, is an underwater sculpture of a woman’s torso that doubles as an artificial reef structure. Can you tell us about how The Art Rising project began? Angeline and Kyle ~ how did you two met and decide to embark on this journey of art and activism together? We met in college at UC San Diego, where Angeline pursued her Masters in International Affairs, Economic Development and Political Science, and Kyle studied Communications. We both came from creative hard-working families who have experienced immense hardship. After school, Kyle spent a year traveling in Asia painting murals and gifting art while Angeline traveled to India to study Yoga, Philosophy and Traditional Indian Art. Once reunited, we birthed The Art Rising as a business model that would merge our passion with travel and philanthropy. Where did the initial inspiration for MAZU come from? When did you first turn your gaze to the sea to direct your work towards ocean conservation? The model we work by is living in a foreign country for 6 months, discovering local artists and collaborating with them. We share our collection of work in the developed world and raise awareness and funds to initiate humanitarian and environmental projects in those developing regions in the following year. Our inspiration for Mazu came from living on the beautiful island of Koh Tao, Thailand while working on a collaboration with Thai woodcarvers. We swam everyday in the ocean, hearing the sound of fish eating coral and free diving to see the immaculate and diverse world beneath the surface. We have been learning about the declining conditions of our ocean. Less than 2% of the ocean floor is covered in coral and it supports the greatest biodiversity ecosystem on earth. Coral is also crucial to 500 million humans who rely on it for food and work. It takes just swimming or floating in the ocean to feel its majesty and beauty. It is necessary for our survival on this planet – if we destroy it, we will destroy ourselves. 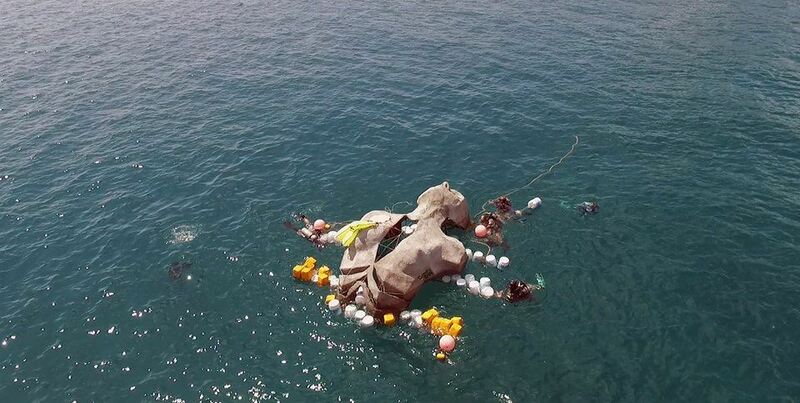 What challenges did you have to overcome to orchestrate the underwater installation? Who did you have to recruit to join your team? We connected with an ocean conservation group called Eco Koh Tao, which has a coral nursery project and a growing artificial reef. They gave us the space to build the sculpture and helped us to deploy it. They built 36 pyramids to go around Mazu which will be part of a huge artificial reef spanning 1 square mile. Each pyramid can house more than 90 coral fragments. We also recruited a dear friend Thaddeus Eschevvaria from NYC to help us design the structure using SketchUp, he calculated every measurement to 1/32nd of an inch. Mazu was made by cutting metal, welding the skeleton, covering her in mesh and coating it with concrete. 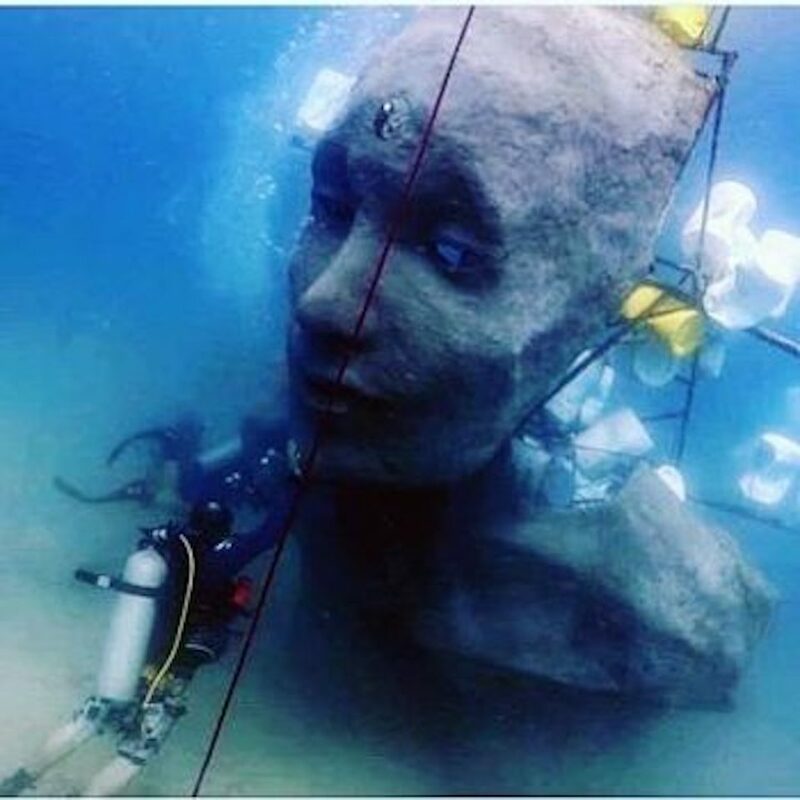 The main challenges we faced were a lack of heavy duty tools and supplies on the island, and the overall intensive labor of building and moving a 4000 pound object across sand, floating the sculpture above water when it was pulled out to sea so it wouldn’t destroy any coral near the shallow waters. Mazu was funded by ourselves through our art sales. It is a work from the heart that goes to the Earth. The financial expense is a challenge but a worthwhile one. How was local community engaged in the MAZU project and how do you think it will be received by the dive tourism industry in the region? Are you tracking the progress of the reef restoration aspect in any way? 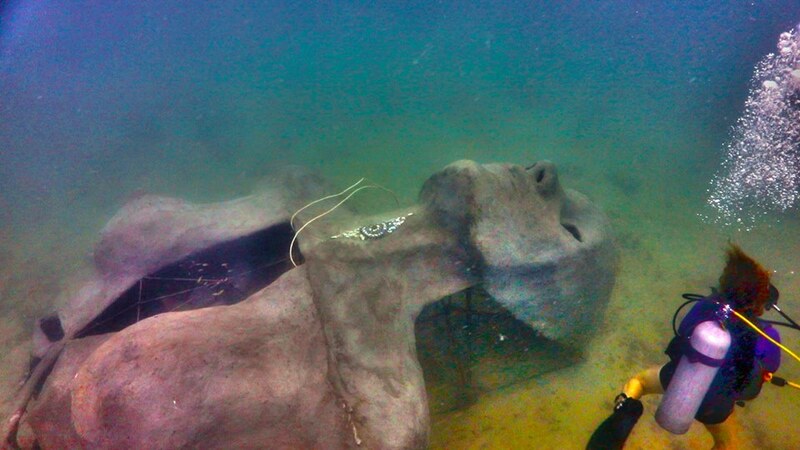 We’ve heard from divers who have seen it underwater, that she has a divine presence. We hope she will serve as a symbol for hope, for the impeccable acts humans are capable of – for the greater good. We hope this will inspire a movement of artificial reefs, more awareness for ocean preservation and greater consciousness in our everyday actions that affect the world we hope to live in for many more generations. Mazu is being documented every month to see her progress – she will soon be encased by an exoskeleton of coral and so long as the Earth keeps turning, could survive for millions of years. 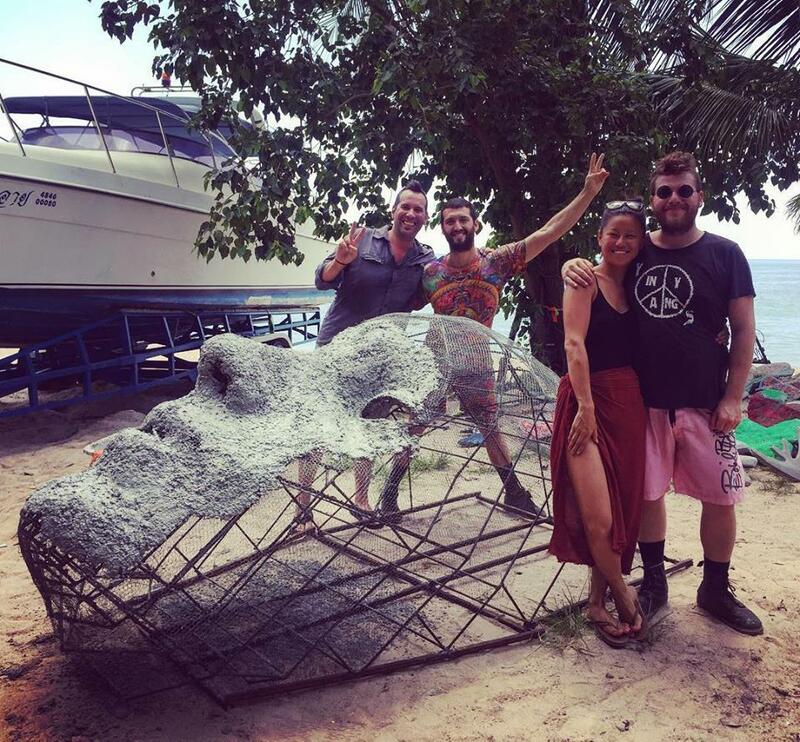 We’re looking forward to creating sculptures for artificial reefs next year in Indonesia and Mexico and open to collaborating with people around the world. Check out more of their work at the below!